Whatever type of holiday you are looking for, our luxury glamping site situated in the scenic Suffolk countryside will have everything you need. Our beautiful location is the perfect setting for a romantic break, family holidays or get-together of friends and family celebrations. 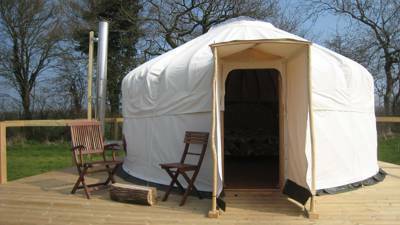 Book the Swallow Yurt, great for a family of three with a gorgeous red wool lining around the walls and a pale linen colour on the roof, there is also a wood burning stove. The yurt it furnished with an elegant French double bed with upholstered headboard (including gold braid! ), a comfy futon chair/single bed and a lovely dresser. On the site you can use the 'safari styled' kitchen, which is great for cooking under cover; there are views out across the meadow, so you can still keep an eye on what's happening. We have fruit and vegetable troughs dotted around the barn so that you can pick or dig your own if you want to - there is no charge for this and we very much hope you'll enjoy the delights of home grown produce. You also have free use of the communal pizza oven, using herbs you may find in the vegetable troughs! In the barn there's an electric kettle and toaster as well as armchairs and sofas, table football, full-sized table tennis, books, maps, fridge-freezers, charging points for phones or laptops as well as WiFi. We aim to make your glamping experience the best and we hope you'll find everything you need here! Adjacent to the barn houses is the 'Owl Cowshed', here you will find flushing toilets, showers, basins, mirrors (as well as your own hot water bottle for the cooler ends of the season) and washing up facilities with plenty of hot water from the solar panels on the stable roof (supported by an environmentally friendly wood-pellet boiler and two huge hot water cylinders). And tucked away outside beneath the rowan tree you’ll find the double woodland shower with proper hot water in a wooded area well screened by willow fencing. Want to re-charge your batteries, explore glorious coastline or quiet country lanes by bike or on foot and enjoy some of Suffolk's amazing gastro pubs and restaurants? Then you've found the right place! Situated close to the coast in an idyllic rural location we aim to offer just what you need to make your stay enjoyable and relaxing, with bikes and maps to borrow, our fun cob pizza oven as well as the covered safari kitchen, an ace barn with full sized table tennis and table football, armchairs and a library of books plus sensible things like charging points, wi-fi, lovely hot showers and flushing loos. Den-building areas in the copses, campfires and a steady supply of marshmallows and starry skies appeal to children both young and old and help create memorable holidays. The 4 yurts and our new Shepherd's Hut are generously spaced in a 3 acre meadow, each sitting on raised decking with its own camping gas stove, campfire and bar-b-q. What better than to sit out as the sun goes down, enjoying an al-fresco meal as you watch the swallows skim the meadow and then see the bats come out as dusk settles, whilst the tawny owls hoot in the trees. Once inside your yurt or hut, besides your cosy wood-burner the comfy double beds have lovely thick duvets to ensure a really good night's sleep under the inky black sky with the Milky Way arcing above. In the morning, take a luxurious Woodland Shower - with piping hot water this is a delight at any time of the day (or night) - and you can hear the bullfinches whistling and occasionally see a rabbit hopping through. Heaven! Out and About: and once your batteries are fully charged, there's plenty to do whatever floats your boat! There's all the traditional seaside things going on at Southwold and Walberswick just ten miles away; both offer great beaches for swimming and sandcastles, pubs, wonderful fresh fish straight off the boats, and, of course, crabbing! If you're a fan of Roger Deakin's Waterlog, you can try some of his favourite local wild swimming spots (we're always happy to share our favourites with guests) or rather more mysteriously, discover some of the places that W G Sebald explores in his Rings of Saturn novel, all very close to us here. Explore the Broads in a canoe or hire a day boat and check out our favourite riverside pub, The Lock's Inn at Geldeston. Bring your walking boots and join one of our monthly full moon walks, or ask us about any of the good local walks by riverbank, coast or inland. If you're a bird-lover, simply relax on your decking and watch the yellowhammers, buzzards and bullfinches, or head off to RSPB Minsmere or any of the great Suffolk Wildlife Trust sites. Bikes: Once outside the five-bar gate you are on National Cycle Route 1 and the world is your two-wheeled oyster with plenty of quiet lanes and cycle routes for exploring. One of our favourite local rides is to St Peter's Brewery, a lovely 15th century abbey with a great pub and restaurant set in the middle of idyllic rolling countryside (there's even a cycling Brewery Tour you can follow if you're a fan of craft beers!). Keen cyclists ourselves, we're always happy to recommend favourite outings. If you're bringing your own bikes we have good undercover storage or we have a selection of "well-loved" bikes you are welcome to borrow plus plenty of local maps. The smallest yurt (Swallow) and the shepherd's hut sleep 3, Lapwing and Barn Owl can accommodate 4, whilst the largest (Yellowhammer) can sleep 5. All have a rechargeable lantern, solar-power fairy lights and their own wood-burners; outside each one has decking area with a barbecue and calor gas stove. There’s a brilliantly equipped outside kitchen, the barn has charging points for phones as well as table football, table tennis, games and books – and WiFi. Next door to the barn is a toilet and shower block, and there’s also a lovely solar-powered outdoor shower for sunny days and moonlit nights. Cookware is provided, and a large basket of logs for the stove, but you will need to bring duvet covers, sheets and towels. 4 lovely fully-furnished yurts and 1 brand new Shepherd's Hut. Glampers, families, groups – yes. The site is right on National Cycling Route 1, so great to explore the flat and intensely quiet roads nearby (there is a selection of bikes to borrow). You could also cycle to the Big Dog ferry nearby, a service which takes you to the marvellous and unique Locks Inn pub just outside Geldeston. If on the other hand you just want to stay put and drink in the peace of the camp, you could join one of the birdwatching courses or wildlife night walks they run from time to time. The coast is not far away at Southwold, a seaside resort that was gentrified before the term was even invented. As a consequence there are great places to eat and drink, and the bonus of a decent beach and excellent pier with homespun attractions. The handsome small town of Beccles is just a few miles north, the southernmost outpost of the Broads and a great place to hire a boat or canoe to explore the waterways. The Queen's Head at Blyford and Queen's Head at Bramfield are both worth a visit and St Peter's Brewery, a 15th century moated former-abbey, just 5 miles away in "The Saints" is a must. definitely not to be missed. Continuing the theme, if you are a brewery fan, check out Adnams at Southwold and try the brewery tour and check-out the fabulous kitchen store and cafe there. The market town of Halesworth has a good range of independent food shops as well as a larger Co-op, so you don't need to worry about bringing masses of food with you. Westhall village is home to The Racehorse Inn, just over a mile away and a lovely quiet walk or bike ride. Despite being so rural, the site is easy to reach, close to the A12 and just a short drive from Bungay and Beccles. From Bungay, turn left at Ilketshall St Lawrence primary school (Hog Lane) and then first right (Butts Road) – the site is about half a mile down on the left. If travelling from Halesworth, turn right at the Spexhall crossroads (the first right turn on this road) along Nollers Lane, then take the first left (Butts Road) and follow the road for 1.3 miles, ignoring the right hand turn to Westhall village. The site is on the right. Hourly trains run to Brampton and Halesworth on the London to Lowestoft line via Ipswich, and Nick and Kim are happy to collect from either station – indeed the site offers an "own steam" discount for those arriving by train, bike or foot.